Here we are at the start of another year. It seems like 2016 flew by. 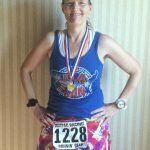 For me as a runner, it was a really awesome year, but I chose goals that played to my strengths: back to back half marathons, trips to races, etc. 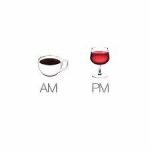 I also chose typical things like manage my time better and drink more water, which feel more like “resolutions”. Today’s Tuesdays on the Run topic is “Runner Resolutions” (yes, I know I need to update my page), but I’m going to talk about some specific goals instead. For several years now, I’ve used this format and it really works for me. Get back into the local race scene. I’ve been really busy with the traveling and racing and only running half marathons. I used to love to run at the local races, so I’ve decided to hit up a bunch again this year. I’ll be doing a 5K, a four mile race, the GW Parkway 10 miler, and a few others. Running these shorter races will also help me with my next goal. Use a training plan again. I was all over the place with my training for 2016. I never really settled into any plan, regardless of the race I had coming up. This week I plan to sit down and put the Hansons Half Marathon plan on the calendar and use that to get ready for the GW Parkway. 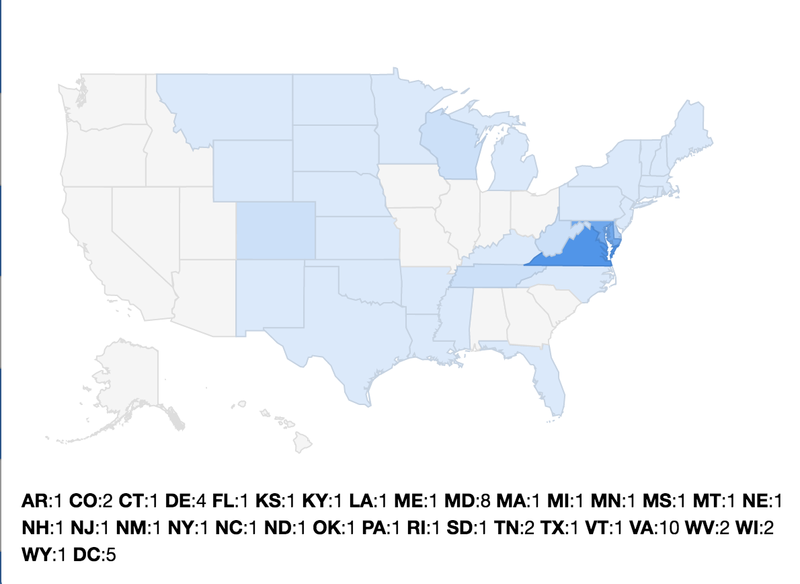 Add another 4 or so states to my 50 states quest. I wouldn’t be me if I didn’t plan at least some travel and racing. And I do still love the half marathon, even if I am backing off a bit. We are planning to hit the Mainly Marathons Heartland Series, but everything else is very tentative at this point. See that white section in the middle? That’s where I plan to run. Batch cook on Mondays. We have activities three nights a week now, so I need to have easy meals for those nights. I figure if I make two large meals each Monday, that will feed us until Friday. We ate tacos entirely too often this year, so we need to branch out. Cross Train at least once a week. I have options in my fitness room and there are tons of videos out there. I need to make myself use them. Bonus if I manage more than once a week. Blog 3 times per week. I began cutting back from 5 times a week earlier this year and I love that I no longer feel pressured by my blog. Hopefully this will free me up to spend more time reading other blogs and interacting on social media. Sub as often as I can at the local library. I’ve subbed frequently this last month and I’m remembering why I became a librarian in the first place. Working the reference desk is a very social job and sometimes I even get a question that takes a lot of thinking or researching. Keep up my 2016 schedule. I started working more hours on the days that I worked and taking one full day to not work. I noticed towards the end of the year that I fell out of that habit, so I need to make an effort to get back on it. Continue cleaning and decluttering. This month I moved a lot of stuff out of our house via a “buy nothing” group I belong to. It’s been great seeing things I don’t need (and are just filling up space in my small house) go to people who can use them. Along these same lines, I need to minimize how much new stuff I bring into the house. Take a trip with Beer Geek. This will always be on my list. We need this time each year to reconnect and reevaluate where things are going in our lives. Minimize Facebook and other social media. I’ve turned off notifications and I’ve left a bunch of groups. I know I need to spend a certain amount of time for blog purposes, but not having new stuff pop up all the time should help with the distraction issue I’ve been having. Keep using my bullet journal to keep me on track. I love having everything in one place and for some reason, writing things down makes them more real to me. I’ve always been a big “to do” list person, so this is just one big (really organized) list. It feels a little strange to not have some BIG.SCARY.GOAL. this year, but there are enough things swirling around unsettled that I want to focus more on the day to day happiness. This is not to say I won’t do something crazy like sign up for MCM again or hop a plane to knock out another state. It’s just that I’m not planning to. At least not today. No big scary goals here this year. How ’bout you? Join us and share your 2017 goals…. How about you? Do you have some rockin’ goals for 2017? Is this going to be a big, scary goal year for you? I’ll also be focusing on smaller things rather than setting on big scary goal. I think your plan sounds great and you have alot of good stuff ahead of you this year! I don’t have any big scary goals, just a big scary question mark for 2017! Fingers crossed that everything settles down. What race are you planning in Illinois? This could be a great opportunity to meet up! You did a great job of detailing your goals. Mine are vague and sort of mashed up. My biggest one needs to be manage time better. Ok I see IL in the white zone. Maybe this WILL be the year I see you! No big scary goals, really. Add 3 more states, hopefully. Maybe 4 if I’m really, really lucky. Good luck with all your goals, Erika! Happy 2017! 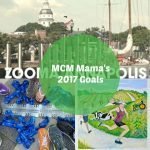 2017 is the year of the big scary goal for me–my first half ironman! 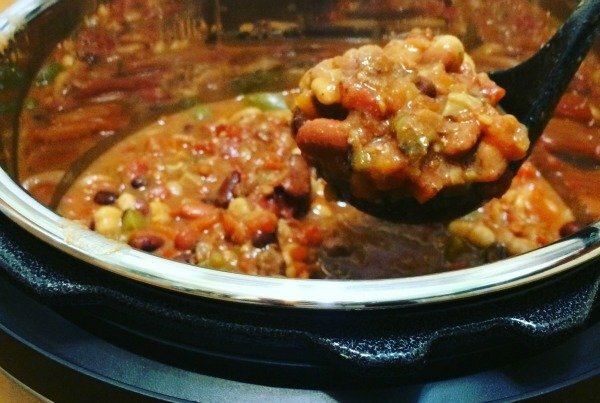 Batch cooking is the best-I do a cooking marathon every Sunday afternoon and it’s been a game changer 🙂 Happy New Year! I’ve got some fun, unique, exciting plans for the year, but nothing to big or scary. Unless hiking Grand Canyon happens. It’s an original goal for me this year. Good luck with all your goals! I should have done a blogging goals. Lol. You’ve got some great goals! I’ve been thinking about cutting back on Facebook on a personal level and being more strategic with using it as a blogger. I think running locally is a lot of fun, I’m thinking about signing up for the Parkway Classic as I’ve never done it! Happy New Year! I don’t have a big scary goal either. I want to make progress, and maybe, just maybe, I’ll think about that speed work. I’m focused on strength, but I really do know speed work would help too. Happy 2017 and good luck with your goals! I batch cook on Sundays, and it’s such a huge help any time, but especially during busy weeks. I’m on my fourth round of using the Hansons method. It’s a good fit for the kind of structure and routine that I like, so it works for me! My big goal for 2017 is to have FUN and not obsess over finish times. Sounds simple, huh! I do monthly challenges, but seldom ever set “yearly” goals. Funny, you are wanting to do more local and I need to venture out and do more out-of-state races! I love the “de-cluttering” goal …I really should consider that, although with my recent move, a lot of our stuff is still in boxes..so this would be a great time to tackle that! Good luck Erika and Happy New Year! 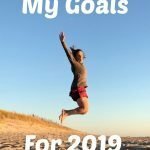 Teresa recently posted…2017 Goals: Ready, Set, Go! No big scary running related goals for me either. Outside of running I’m hoping to make a job change this year – that will keep me on edge! I don’t have any big scary goals for this year either! Subbing at the library sounds fun and I admire your batch cooking on Mondays. I wish I could do that! DAMN I ADORE HOW YOUVE LAID THIS ALL OUT. I NEED TO LAY MINE ALL OUT AS WELL. Carla recently posted…Writing a fitness mission statement. My “Big Scary Goal” this year is the Devil Dog Double Challenge at the Marine Corps Historic Half here in Fredericksburg in May. You run the Semper Five Mile race first, but you have to finish in 45 minutes, which means keeping a 9-minute per mile pace. That wouldn’t be so daunting if it weren’t for Hospital Hill. After the 5-miler you turn around and immediately run the half (which means tackling Hospital Hill for a second time during the last couple of miles) and finish all 18 miles within 4 hours. Frankly I’m not worried about finishing the half in time, it’s that first 5 that scares the crap out of me. 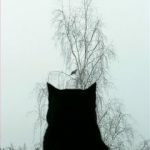 I’m working on my resolutions now (some running goals, some not) and I’m hoping to get that up by Friday at the latest. It takes me a while to get posts finished and up. I’ll link it up here as well, and thanks! I love it that you enjoy the reference desk as a librarian! 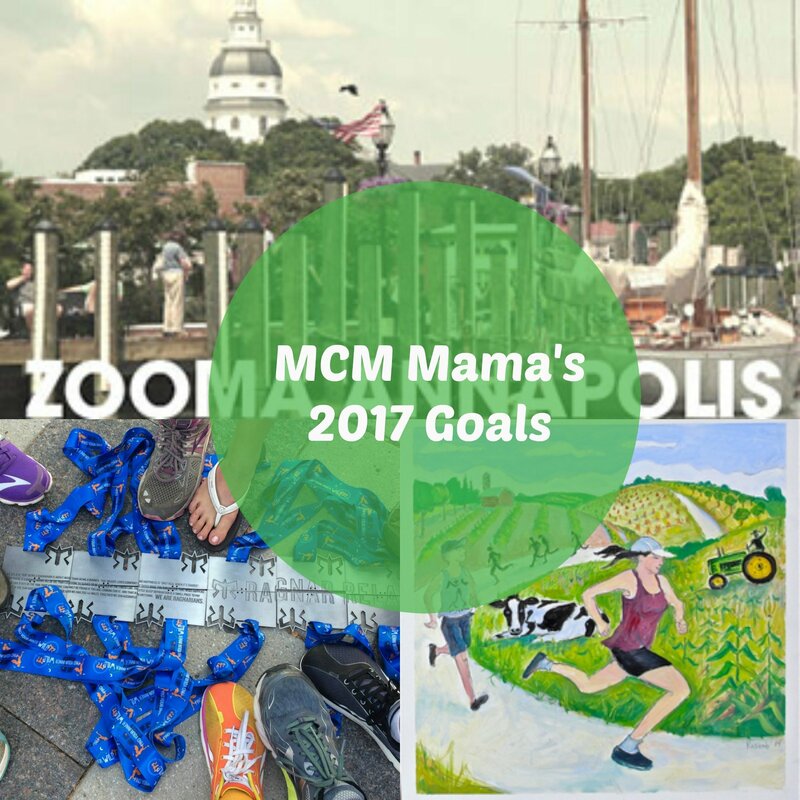 you’ve got some solid goals this year and I have a feeling you will sneak some big scary running goal in there without even realizing it…. I hope you have a great start off to the new year! 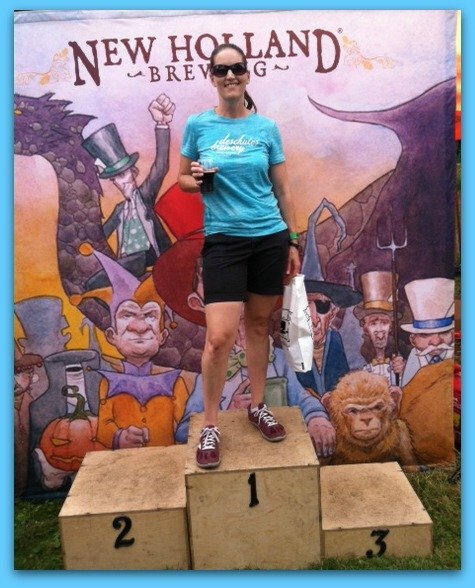 melissa cunningham recently posted…Highlights (and low lights) of Running in 2016….. 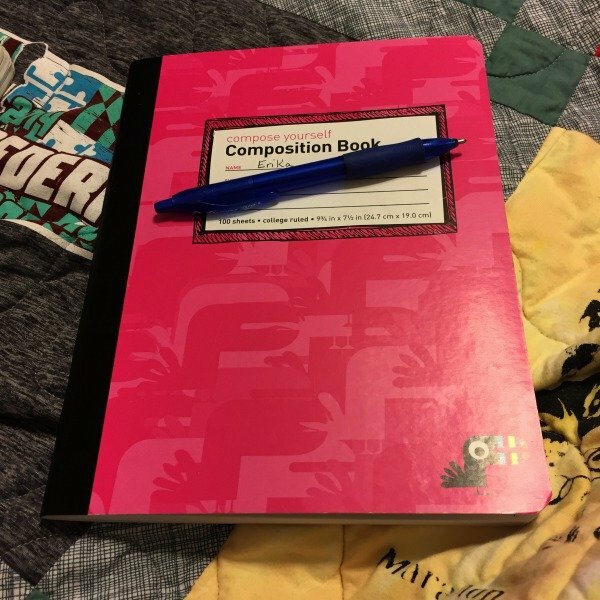 I use my planner a lot and even though I try and utilize the digital aspect of my phone I really do better with pen and paper. I need to look into this bullet journaling. I bet I’d like it. Any suggestions on resources to get started? Happy New Year… you have some great goals! I’ve got my running ones down, but I need to work on my personal ones. Yes, there are so many great local races! I need to find some good ones around DC! I’m going to look at your race recaps.